I started taking P out on the court before she could walk. I use to stick her in my wrap and we would both grab onto the racket while I hit. She was so into it last year. 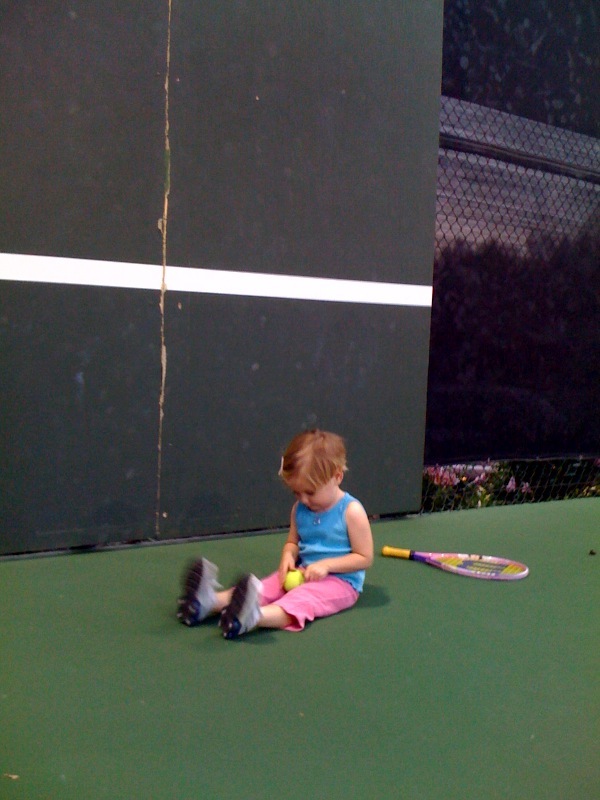 At 14 months she could drop the ball with one hand and hit the ball with the racket in the other. I was so impressed and excited. This year, she wants nothing to do with the sport. She can’t hit the ball or even drop it in front of her. Yesterday I asked her why she didn’t want to play. She said it was too hard. We’re out on the court with her friends and she still doesn’t want to do it. D and I have opposing opinions about this. Because of my background and experience I don’t think P should be out on the court at all. If she doesn’t like it, we should be doing something she does like and come back to tennis when she’s into it. Tennis is one of the highest skilled sports. She should do gymnastics, swimming or soccer or something that builds other primary skills before tackling a sport that involves multiple ones. D thinks she should be out there and eventually she’ll want to join in the fun with everyone else. He thinks she’ll see us enjoying it and eventually she’ll enjoy it to and want to play. This coming from an individual who was never MADE to do anything he didn’t want to. He grew up with no structure or consistent involvement from his parents. I read a friend’s blog quite often: All Pro Parenting. He has many similar topics on his blog and he’s been an NFL quarterback so he knows every stage of the sports world. I also appreciate that his thoughts, like mine, are all about being a great parent first. Having a well-balanced, happy child is more important than having a pro athlete. However, since genes play a great role in athletic success and if our children have a passion for a particular sport (s) then we’d like to nurture it in the best way possible. I’m really not sure what to do at this point. I think one of the reasons P is not interested in tennis is because I think she relates it to me not paying attention to her and instead paying attention to other children. Last summer I wanted to have other kids involved in her learning process. I was always alone on the court and had no friends, which I hated. I wanted to make the experience enjoyable for P so I invited neighbors to come take free lessons. Every Saturday and Sunday I took 2 hours out of each day to do lessons. Because P was the youngest, she ended up sitting by the side lines and I would only work with her only while the kids picked up balls. I’m sensing the same issues this year. I think I need to restructure our time on the court. I do think that P as well as the friends who join us need to work on some of tennis’ basic movements. Maybe I need to break it down and do activities that aren’t tennis to the untrained eye but really are part of the basics. ie, I need to make it fun but keep it active. Today I noticed that P was having a hard time climbing a play structure. She’s NEVER had a hard time climbing it. I haven’t hiked with her since January. I’m starting to worry about her athletic ability. I know this sounds crazy but she has always been very coordinated and smart with how she moves. I see that fading. I’m wondering why. Lack of practice? Too much sugar in her diet? I’ve slacked as she’s gotten older. And then of course my mind goes to some sort of developmental disorder. Then I remind myself that the mind develops in phases and oscillates from left to right brain activities. She’s been very creative lately. P’s been begging me to read to her constantly. Maybe it’s just a growth phase.